If you are in the restaurant business then you understand how much your ingredients like cheese really cost, since you purchase them from your suppliers on a regular basis. Think about this for a second… Let’s say you’re making your best selling pizza or your most popular sandwich. What if you could cut back on your most expensive ingredient by just a smidgen. Actually, a better way to say it would be — what if you could develop a consistent way to add your ingredients so that every large pizza had exactly eight ounces of cheese or six ounces of pepperoni. The results would hopefully lead to more profitability and a consistent product your patrons could enjoy each and every visit. This outstanding must read article that is referenced below goes into great detail about portion control and why it’s so important to a company’s bottom line. “You can have the best pizza in the world. But you can lose your shirt if you’re not careful,” he said. “If you ain’t weighing it, you are winging it.” While many operators habitually weigh dough balls, nothing provides a pizza operator with more margin/cost control than weighing their cheese portions. …. it’s important to keep cheat sheets for employees to remind them how much cheese to use, and even have the cheese pre-weighed in cups for them. This allows an operator to ensure consistency and to know the cost of every single pizza. The difference, for example, of 7 ounces and 10 ounces of cheese can be 60 cents per pizza. He also suggested adding a weighing scale that is easy for employees to use. Training and incentivizing is important for employees, who may free throw either through habit or to save time. …. At the end of those 30 days, the concept saved about 200 pounds of cheese totaling $1,200, which was then split between the four employees as a bonus. I like how the author wrote this article since it’s always great to see real world examples. As you can see from reading the entire article, your business can really benefit by adding some type of weighing functionality into your kitchen. Not only does this help control costs but it should also help restuarants increase their consistency. How many times have you gone to a restaurant and had one pizza with too much cheese or too little sauce, then you go back a couple weeks later and it’s the opposite problem. Customers love a consistent sandwhich or entrée (just ask my in-laws). 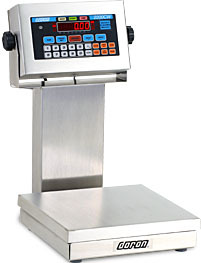 If you need some guidance on choosing the correct scale for your restaurant or prep kitchen please contact our sales department at 919 776-7737 or visit our site centralcarolinascale.com which has many scales posted for you to view. We also have a Youtube channel that shows a few of our scales in video format.